The CD-ROM drive of my IBM Thinkpad R31 was broken for a very long time. Wietze, a very friendly colleague this week was so kind to donate a replacement drive. The replacement job took about 20 minutes. The most challenging part turned out to be the front cover of the CD drive. 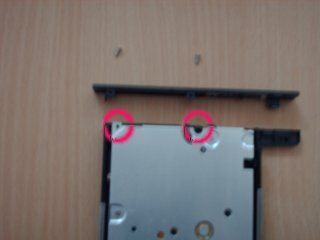 The front cover of the IBM Thinkpad R31 CD-ROM drive is not square but the donated drive did had a square front. After some puzzling it turned out that there are two screws to be removed. After that, a notch has to be pressed and with a little bit of kind persuasion the front comes off. After the replacement of the front the replacement drive was fitted into the R31 (just sliding in), it was time for the final test. So we are happy again! Thanks a lot, Wietze!